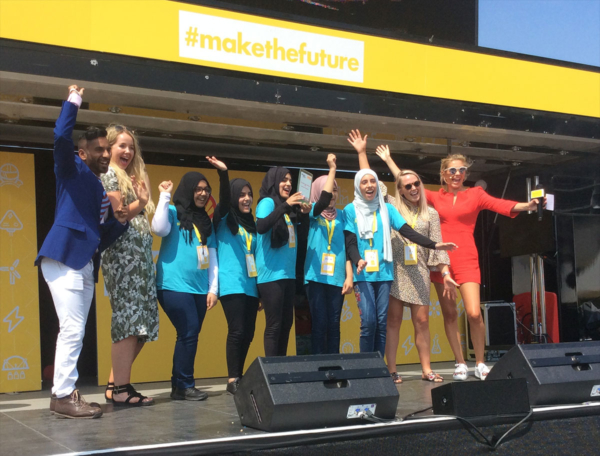 A group of Year 9 students presented their idea for solving the energy crisis at the Shell ‘Make the Future Live’ festival in London on the 5th and 6th of July and were voted national winners by the public. The school has been awarded £5000 to contribute towards STEM. The competition required students to design an idea to address the issue of increasing population, global warming and a shortage of energy resources. The team, ‘Bright Beautiful Beginnings’, designed a shoe to harness the 7000 steps we take each day by converting the mechanical stress into direct current. This electrical current could then be stored and used to charge mobile devices. In addition to travelling to London to build a 3D printed prototype, the team took part in a public speaking workshop and created a pitch for their idea. They then presented their idea to the public during the Make the Future Live festival and were voted the brightest idea! We are so proud of our students for how they have represented our school and worked as a team. This has been an amazing yet challenging experience and it was awesome to see our students pitching their idea to the public so confidently. A very well deserved win!